That's right! I had TWO holes in my wall! 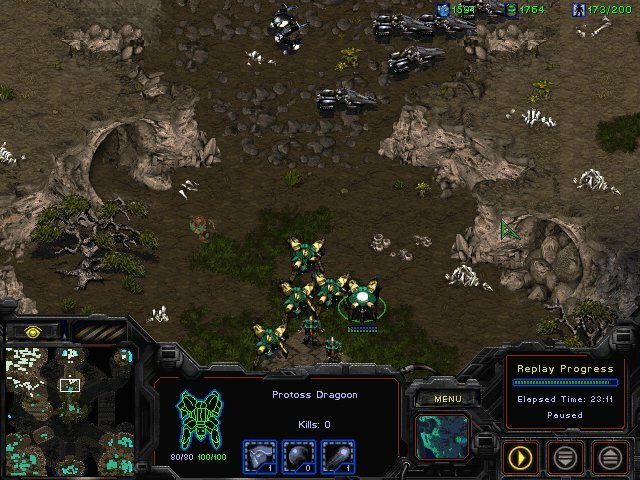 I started playing bw around 2001 mainly "fastest possible map" with a few friends of mine. 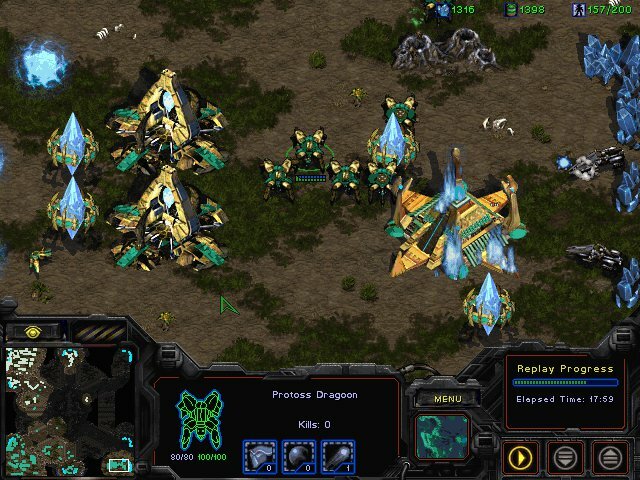 About an year later I decided to make the move to normal maps and began laddering on WGT, playing protoss only. I managed to enthuse one of my friends to start playing normal maps, too. 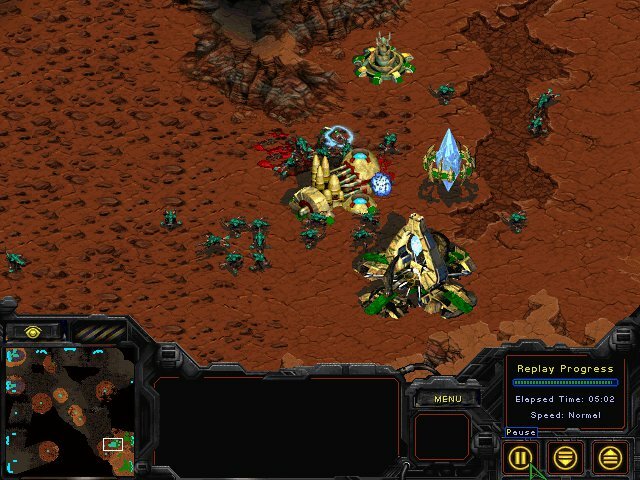 Over the course of a week we played through the whole WGT mappack: me - protoss, he - every race (no random though). It was tons of fun discovering all the different maps, especially after playing a single map (fastest) for over an year. Added enjoyment came from the fact that I was easily winning 90% of the games. 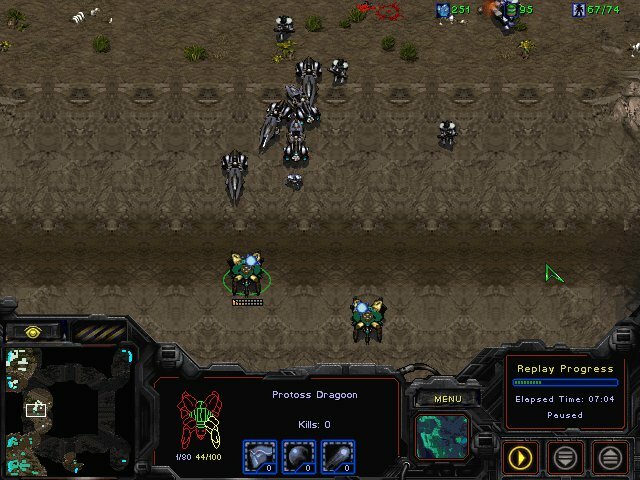 After we finished the mappack, we continued to play only on a selected few maps (6-7) and he picked protoss as his only race. For about two weeks I dominated him completely (close to 100% win ratio made PvP my favorite matchup), but he didn't give up. Besides our games he played 10-15 more games a day (although half of them on fastest) and at some point he started not only taking PvPs from me, but fully destroying him to the point where I could only win by sheer luck. 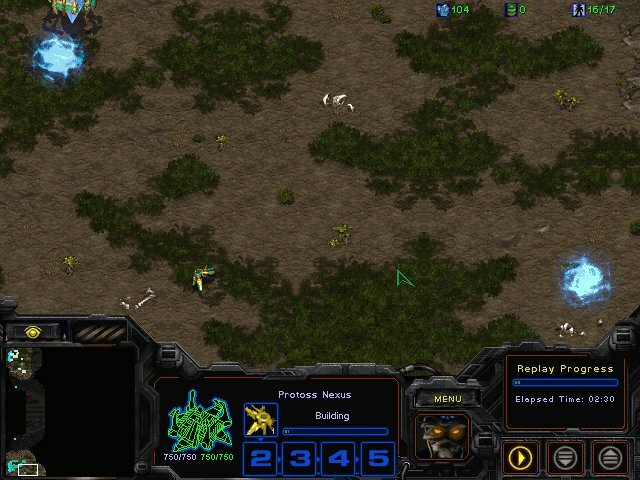 Being the kind guy he is he switched to play his off-races... and still dominated me with zerg. 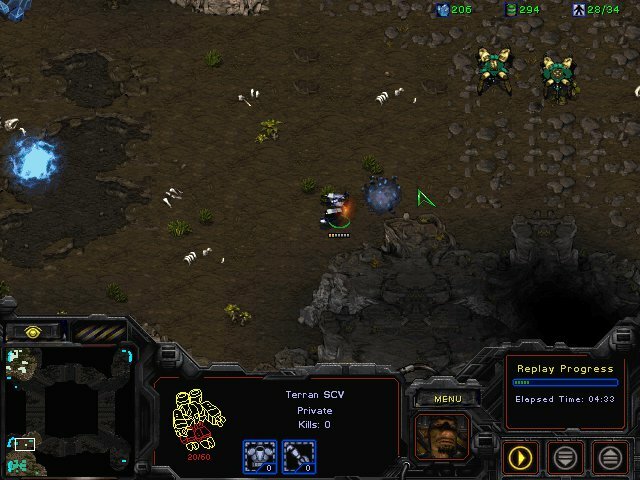 However, in PvT it was an even 50/50 situation so at some point he sticked to terran. BW became extremely exciting and interesting. Every game was nail-biting and very close. 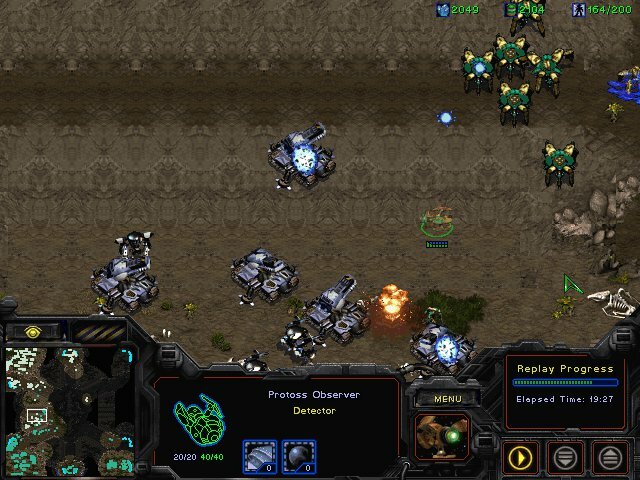 My "skill" increased: I had a variety of strategies, I started doing zealot bombs and playing with stargate units, and my apm increase from meager 100 to over 130. 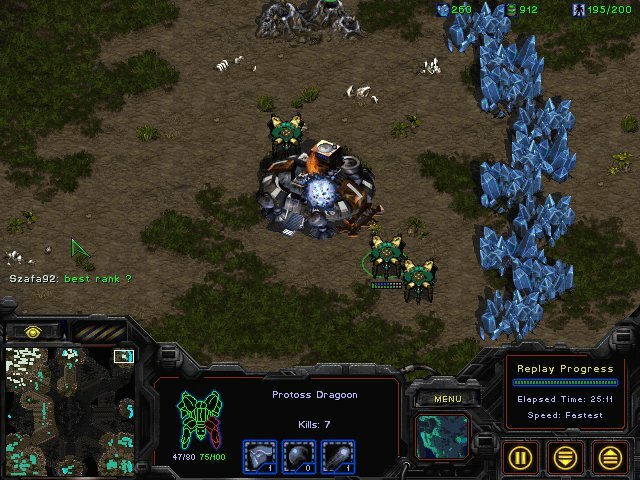 This way PvT became by far my favorite matchup. ...but all good things come to an end... while I was playing 4-5 games a day, he was churning out 15-20 games and a month later I was no match whatsoever for him. 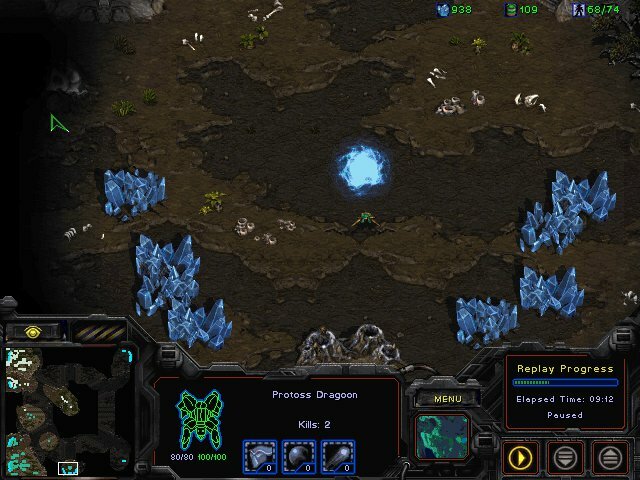 I dropped bw and moved on to wc3:tft. He continued with bw, won a bunch of "fastest" tournaments, joined a team in bwcl division 1 (for normal games), and played against guys from Germany's B-team. A pylon placed in the corner of my base so I can hide my robo tech there! Brilliant! That's not enough gas for a robo!? After setting up the scout prevention measures, I stop unit production in order to get range and two more gates for production in case of him attacking me early. So much for scout prevention... The scv walks by and scouts the expo and my entire base. 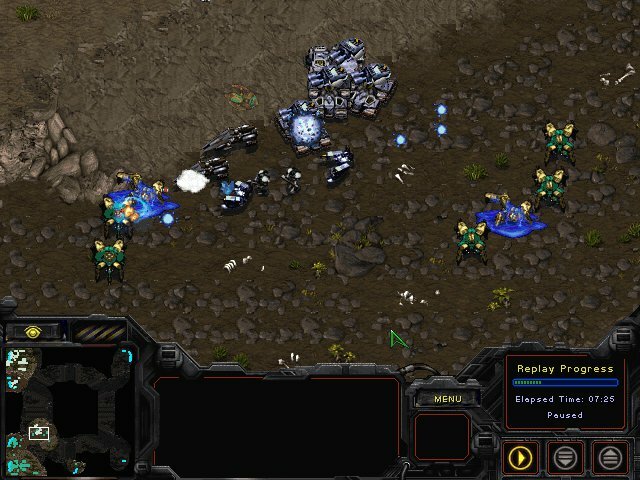 I remembered that when I used to play a lot of bw I always went for a fairly fast robo against terran, but I couldn't quite recall why. And then it hit me! The vultures' mini-nukes are nasty! I did get to hide my robo! Also, notice the "neat" placement of my gates. I started churning out goons and added a fourth gate so I don't get overrun by some wacky timing attack. 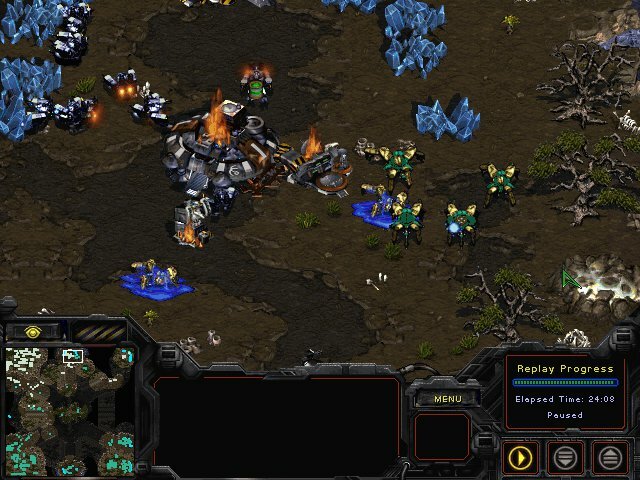 I figured unlike my first terran foe this one might not consent to a "15 min no rush" game. Attack at 7:00. Apparently, not a peace-loving person. I had sent out two goons half way to his base as a precaution in case he attacks, so I was able to spot his movement early enough. Luckily I had a lot of goons waiting at my base and even more were in production. However, with my reinforcements I managed to push him back. Apparently, he tried to contain me. He even built a few turrets, but I killed those after he turned his tail. After 3 years without bw, it turns out that my multitasking is somewhat "rusty". After the battle I had banked up 1.3k minerals, so I decided to place a third nexus. Did you notice the 5 white dots in the screenshot above? 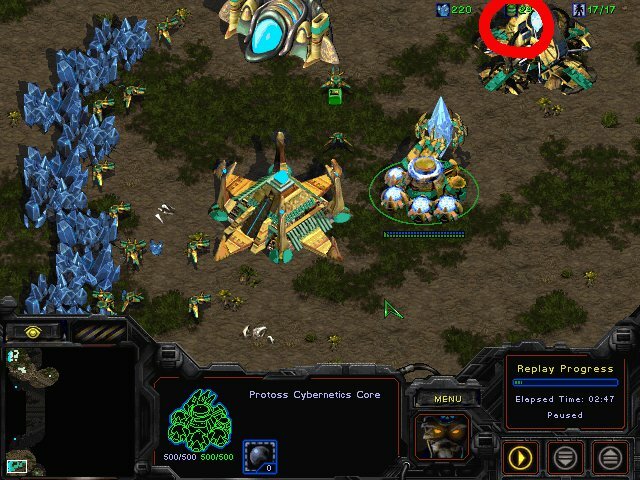 Those nasty vultures wanted to swing around and kill innocent probes! My split-second reaction (and goon massing) prevented any real damage. Only 4 probes died. Nothing much happens in the next few minutes. He tries to set up a position in between our bases, laying tons of mines. I clear those out with barely any casualties on both sides. 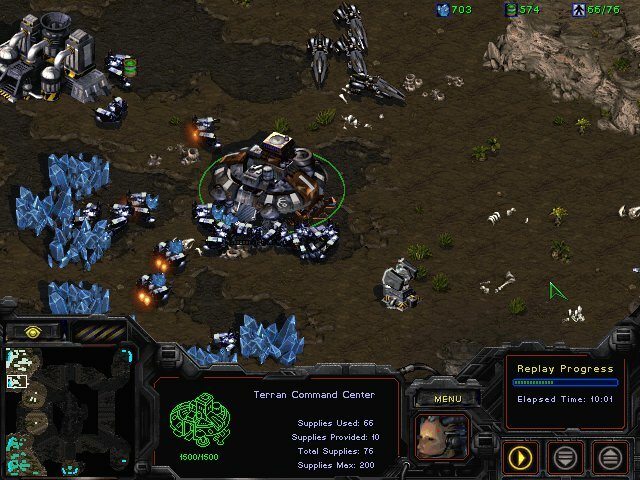 He finally sends an scv to build a third CC. I manage to let my macro slip yet again despite 9 gates. And of course, I also manage to get a goon stuck due to bad gateway positioning. At some point (around 170 supply) I decided to attack into his siege line. 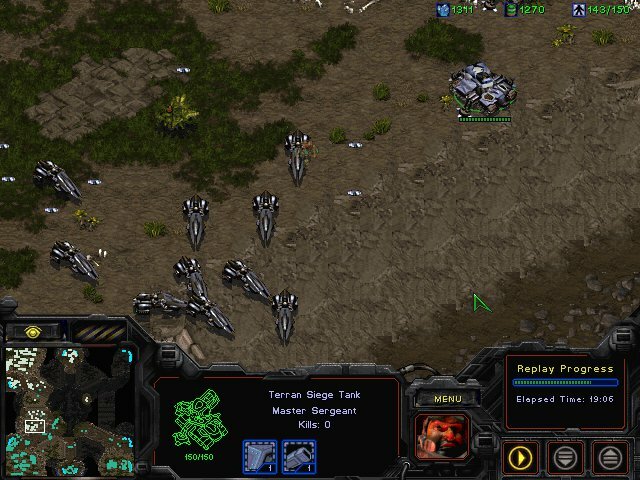 I was supply blocked yet again so instead of waiting for my pylons to finish, I figured I can suicide a bunch of units and maybe reduce his tank count. 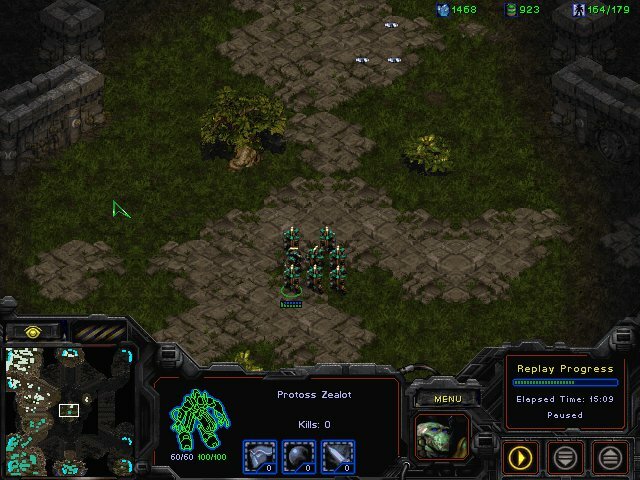 So I decided to set up a flank with a bunch of zealots and try to push him back again. So much for my flank. 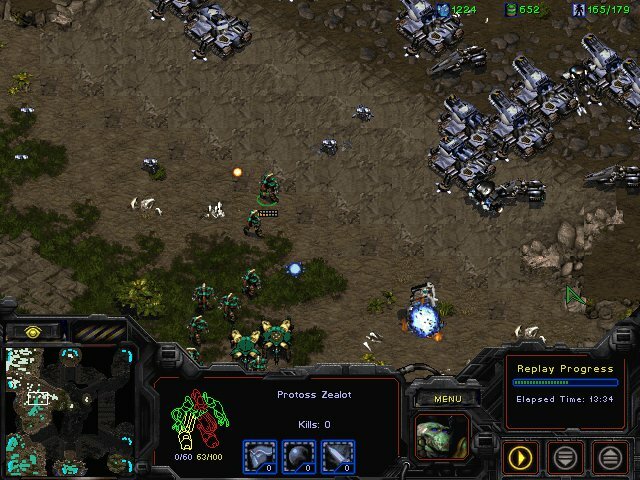 Of course I ran my bunched up zealots into 3 mines. None of the zealots died, but 5 were left with 6 hp and the rest was softened up, too. So I decided to send them into his third, which I had scouted with one of my four observers. Another observer of mine let me see that he moved a huge chunk of his army after my zealots attacked his third (presumably to defend it). So I took the chance and attacked his position in between our bases with everything else I had. Like a real progamer - attacking at two positions at once! I cleared his position inbetween our mains and my harrassement did a decent amount of damage even causing him to lift his CC for a while. However, it turns out that his units, which I saw moving after my zealots reached his third were actually meant to kill my third. Without me noticing he crossed through the middle of the map and sieged up my third. I immediately sent my whole army to deal with his attack and managed to stop it before acquiring any significant losses at my third. 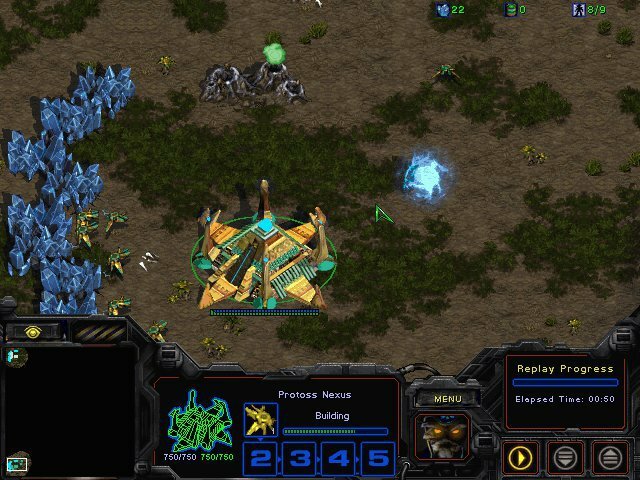 Actually, neither my nexus nor any of my probes there died, since his tanks autotargeted the four cannons I had placed there first. By the way, did you notice the green dot in the bottom right corner in the past 3 screenshots? That's a probe I sent there in order to build a fourth base. After chilling there for 3 minutes, it finally placed a nexus. Turns out, I'm not the only one attacking two places at once. 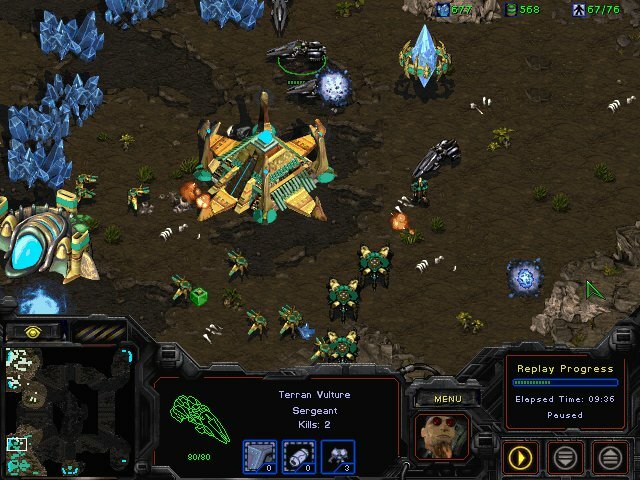 While sieging my third, the terran sent 3 vultures to check for a fourth base. Luckily my goons arrived before it died. Tanks on high ground - something all dragoons dread! The green line next to the sieged up high ground are units of mine that are going to the middle of the map in order to flank his position. Yet again I have no observer in the middle despite having 6 observers out at this point of the game. However, this time around there are no mines there to cripple my units. An awesome flank! Sun Tzu would be proud of me! 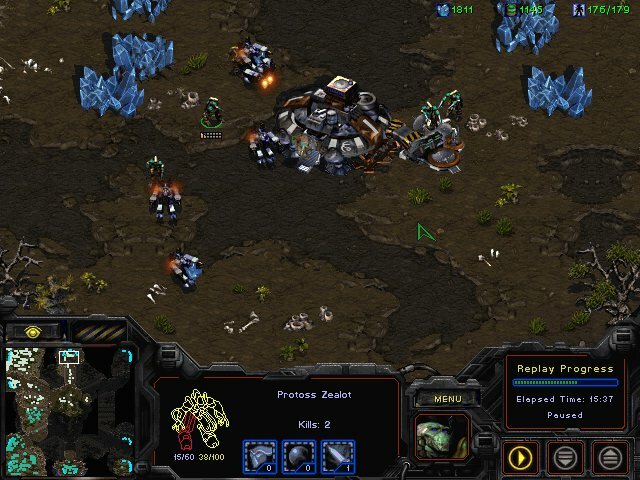 After a lengthy engagement and second zealot only flank, I regain control of the whole path between our bases. His tanks finally stop me when I reached his natural. However, in the meantime I put down a fifth base. Things are looking grim for him. I decided to "poke" his third. My fifth is already running, while his fourth is still under construction. Those goons had a field day in his third! He barely manages to clear them out. I also sent some forces into his natural. They were stopped at the very end, but I had accumulated a new huge army in my bases. 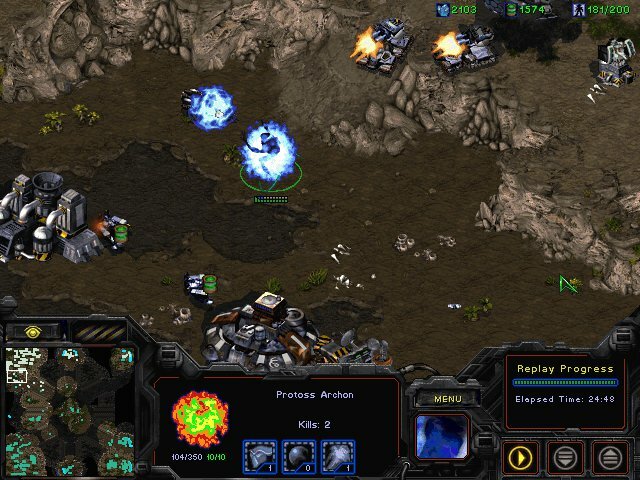 A lone archon striking awe in the terrans' hearts! 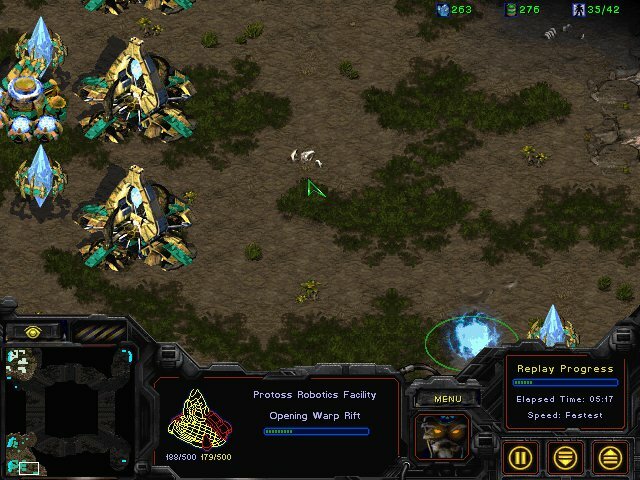 After three dragoons destroyed all scv's at his fourth (and 80-ish supply marched into his natural), he finally conceded! The obligatory question, when losing to a D-rank player with no games played. Wow dude this blog rocked. Enjoyed every bit of it! I might go play some games and post one up myself. What was your best rank anyway? I was always hovering at the upper border of D+. With the motw point bonuses I could enter C- but would drop instantly down to D+. Sick battle report. Congrats on the win . Thanks for the write-up, and as the guy above me said, grats on the victory! Grats! Well played and well written. This is awesome man, I've never played BW but I might download it now and see how it goes? What a coincidence. 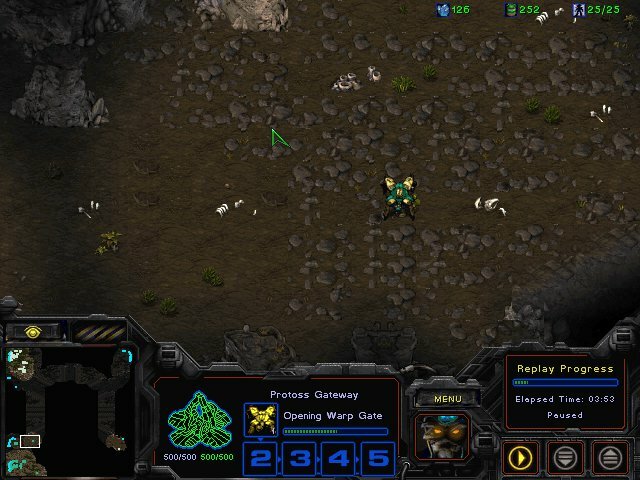 After not playing BW for almost a year and a half, I myself just played some games on iccup few days ago and today. Lost 3 games in a row to drop to D- (lost to 12 nex on cross position, crazy zerg, and 1 hat lurker LOL), but bounced back to 1600s now. One thing I forgot about D rank is how cheesy some of these guys can be. It's the best, but most of us who play have played and watched on and off for years, so you will do a lot of losing to catch up. But the ones you win are the most rewarding feeling in the world. 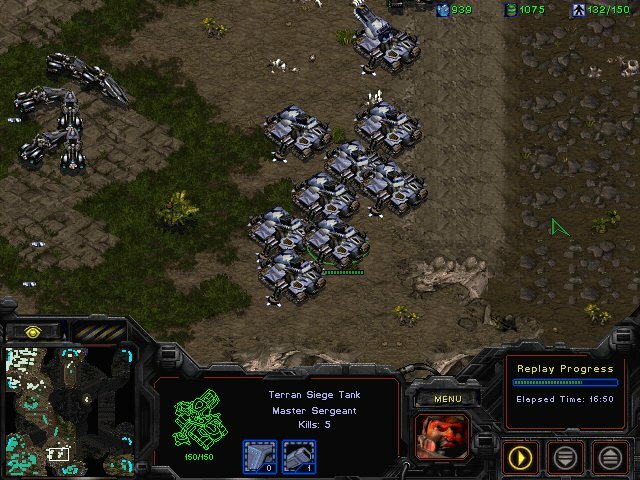 do you see the train of white terran reinforcements? Sun Tzu would be beaming, and more generally pretty impressive to have a 3 year hiatus and survive a game like that.